The Golden Jubilee Celebrations of Handicraft Resurgence in India was held from the 15th to the 18th of November, 2002 in New Delhi. 10 members were awarded the title of ‘Shilpa Gurus’, the highest honour awarded to craftpersons. The President of India honoured the craftpersons by awarding them the certificate and a golden medallion. The Shilpa Gurus were also accompanied by their prominent students (Shilpagnas) who were honoured by the Crafts Council of India. 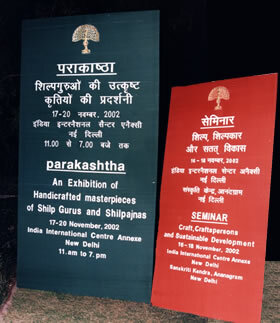 The works of all these Shilpa Gurus and their outstanding students (Shilpagnas) were exhibited at the venue of the seminar. Being exposed to a different world other than that of academia, I have gained through my 17 years of membership in WCC-APR invaluable experience, wider scope of knowledge and depth in human relations. I proudly admit that the self-satisfaction which I attain from organizing handicrafts events, attending functions in other member countries, or helping to fulfill the slightest aspiration of craftspeople, keeps me full of energy, hope and love for a “Life with Purpose”. A Seminar on “Mastercraftspersons and Sustainable Development of Handicrafts” was also held during the event. The Shilpa Gurus and shilpagnas aired their views and had a good interaction with NGO representatives and the public. The Business Meet of the Asia-Pacific Regional Assembly was held from 15 – 18 November, 2002 in New Delhi. There were representatives from eleven countries. Important issues of cooperation among the countries of the region were discussed. The offer of National Crafts Council of Bangladesh (NCCB) to host the 26th Asia-pacific Regional Assembly in Dhaka, Bangladesh in the month of October was accepted. The offer of Lebanon to host the Regional Assembly in Lebanon in the year 2004 was also accepted.